HomeFeaturesSuper statto: SearsAnd meanwhile on Merseyside, a football match . . .
And meanwhile on Merseyside, a football match . . . The Merseyside derby takes place at Goodison Park this weekend with Everton and Liverpool on fairly equal terms; they have been fairly equally bad this season, that is. A chant of “6-1! 6-1!” should normally signal a joyous occasion. Today it’s a statistician reciting the number of points won, and games won, by each of the Merseyside clubs in the Premier League this season, after seven games apiece. Seventh heaven? Hardly. Six as a parrot more like. 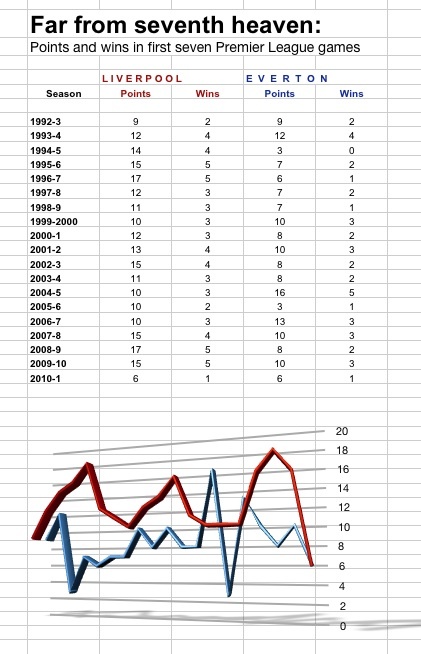 There’s no need to dwell on this Mersey misery – how the mighty have fallen is laid out in the table and graphic below, which shows the number of points that Liverpool and Everton each amassed after seven games in each of the Premier League seasons to date. Liverpool’s best starts were in 1996-97, when they racked up 17 points from seven games (and finished fourth, but on the same points as the club in second, Newcastle), and then the same tally in 2008-09, when they finished second. As for 2010-11, this is a low, as Blur might sing. (Now that Chelsea fan Martin Broughton has helped to save Liverpool, we feel there should be no barrier to injecting Chelsea-supporting Damon Albarn into this). Never before in a Premier League season have Liverpool won as few as six points from their opening seven games (see table). Everton’s peak Premier start was in 2004-05, when they won 16 points from their first seven games, and went on to finish fourth. This season is not quite a low for them: in 2005-06, they won three points from their first seven games, and finished 11th.